For those who like to make their own lures, here is a site for you to display them. 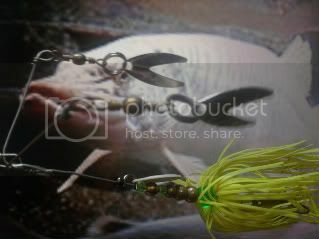 You need to be a member of Home made Fishing Lures to add comments! Hey guys I'm new here. Here is a TandemBlade Inline spinner. That's Cool Al, I'm glad to hear it worked out. And it passed the field test with an A+! I put a lip on the pike lure and it passed the bathtub test. I'll be able to do some field runs now that fishing season has started. It sits upright in the water, but the eye screw on the lure as it is pictured here is too high on the body. It just gets pulled along at a skew. I put it at the front of the snout but it now has no action. I have some .22 calibre pellets that I use for weight, but I was hoping that a lathed body would alleviate the need for them. I'll have to play with them a bit I guess. As for plastic lips, does anyone have any suggestions or tricks to make and install them? I'm still gathering up tools for luremaking and I have difficulty getting them symmetrical and positioned good. Take care for now, guys. Catch ya later on. Hello Al. How does the pike lure sit in the water? What I like to do is add weight to the belly of the lure. I usually do this in the beginning stages. I seal the lure first, add the eye screws and hooks, and see how it floats. To fine tune the lure I drill a hole in the bottom where I want to add the weight. Split shot of various sizes works great. Epoxy them in, let dry and test again. When you have the desired effect or float, fill in any gaps and finish the lure. I suggest putting a plastic lip on the front of the pike, to help pull it down into the water. This will also give it a wiggle. Me too. It rides a bit low in the water but it turned out real well. The pike lure was just a prototype that needs to be experimented with. It failed the bathtub test and when I tried it in a salmon tank at work (the hooks were taped over haha) it failed miserably. I'm might try putting a lip on it and seeing if it will make a good diver. Do you have any suggestions as to what I can do to it? Anything that will keep it upright and give it a bit of action. In answer to your question about a finish, here's a video on youtube where a guy does it with epoxy. Enjoy.